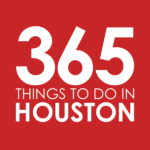 In our series of Must Do Things Around Greater Houston, we take a look at Houston’s vast array of neighborhoods to bring you five fun, tasty, and enticing reasons you should give each a visit. Originally published in 2016, we are now refreshing, updating, and adding to this series, including new neighborhoods and destinations. Sitting in the southern end of the Museum District, Hermann Park is one of Houston’s most picturesque and iconic treasures. In addition to housing landmarks like the dazzling Mecom Fountain and Sam Houston Monument, the 445-acre park offers plenty of fun and relaxing ways to spend the day. See giraffes, monkeys, and lions the Houston Zoo – One of the crown jewels of the Hermann Park is the 55-acre Houston Zoo, where you’ll find more than 6,000 animals in natural habitat-style exhibits, including tigers, cheetahs, elephants, gorillas and orangutans, warthogs, sea lions and more. Animal lovers can visit exhibits like the African Forest, Bird Habitats, and Reptile and Amphibian House, or feed giraffes at daily feedings held at 11am and 2pm. The Zoo also hosts a lineup of fun programming throughout the year, from meet-the-keeper talks to fun annual events like the Halloween Night Prowl and Feast with the Beasts. Tickets are $19 for adults, with discounts for seniors and kids; free for Zoo members. Open 9am to 7pm seven days a week (winter hours run from 9am to 6pm). Click here for directions. Hit the trails and stroll through the gardens – Hermann Park is easily one of the most beautiful spots in all of Houston, hosting numerous gardens and trails that provide a perfect escape from the city’s hustle and bustle. Hit the tree-lined McGovern Centennial Gardens and you’ll find 8 acres of serenity, with a spacious central lawn, gorgeous Rose Garden, interactive Family Garden, and cool things to explore like the sculpture promenade (walk around Hermann Park’s entirety and you’ll discover even more art in the park). Those looking to get zen can wander the stone paths of the Japanese Garden, a hideaway complete with cascading waterfalls and bridges, Japanese maples, cherry trees, crepe myrtles and more. Both gardens are free to the public and open daily. Runners and walkers can check out the Marvin Taylor Trail, a picturesque two-mile path that offers the shade of historic live oaks; and those looking for a longer stroll can explore the scenic Bayou Parkland, an 80-acre oasis for native plants and wildlife nestled along Brays Bayou. Be sure to take a walk around the easy-on-the-eyes Mary Gibbs and Jesse H. Jones Reflection Pool. Catch a show at Miller Outdoor Theatre – Spending an evening at this striking outdoor amphitheater is a Houston right of passage. The cultural treasure’s programming is always free and open to the public during its March-November season, offering a variety of productions ranging from children’s and performances and a yearly Shakespeare Festival to appearances from the Houston Ballet and popular concert artists. Bring a blanket or a chair, grab some snacks from the concession stand, and enjoy the show. Covered seating is also available for free, with some performances offering assigned seat tickets on a first-come basis while supplies last (these tickets can be snagged at the box office behind the theater on the day of performance between 10:30am and 1pm). Click here for directions. Pack a picnic – The park boasts many locations perfect for a leisurely picnic. Between Miller Outdoor Theatre and Lake Plaza, you’ll find a dedicated Lake Picnic area, offering picnic tables and grills, a swing set, boardwalk, and new trails. For large parties and gatherings, the Fannin Pavilion offers a covered space capable of holding about 100 people. And the Bayou Parkland hosts a multi-use pavilion with a comfortable place for picnics. Ride the train or take a pedal boat out on the lake – Taking a two-mile, 18-minute journey and with three stops around the park, the Hermann Park Railroad is fun for the entire family. Cost is $3.50 per person or $7 for an all-day pass. 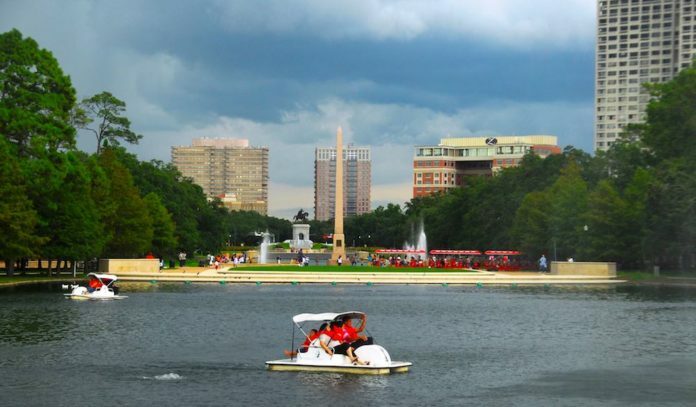 Visitors can also take a pedal boat ride among the fish, duck, and waterfowl on the eight-acre McGovern Lake, starting at Hermann Park’s Pedal Boat Lagoon. Cost is $11 per boat for 30 minutes.